Mercure Hotel Duesseldorf City Nord. Book now!Free Wifi! The 4-star Mercure Hotel Düsseldorf City Nord is located in the Moersenbroich district, just a few miles north of the city center. All 190 rooms have free WIFI. Our events area is available for meetings or private functions. The six meeting rooms accommodate up to 190 people. Arrival: The hotel is 3.7 miles (6 km) from the main train station, 5 miles (8 km) from the airport, and just a few hundred feet from the exits of the A3, A44 and A52 highways. This cosmopolitan city on the Rhine has many strengths: Düsseldorf is the capital of Germany's largest state, an economic heavyweight and a centre for art and the art trade with galleries and museums of international renown and the Academy of Arts. 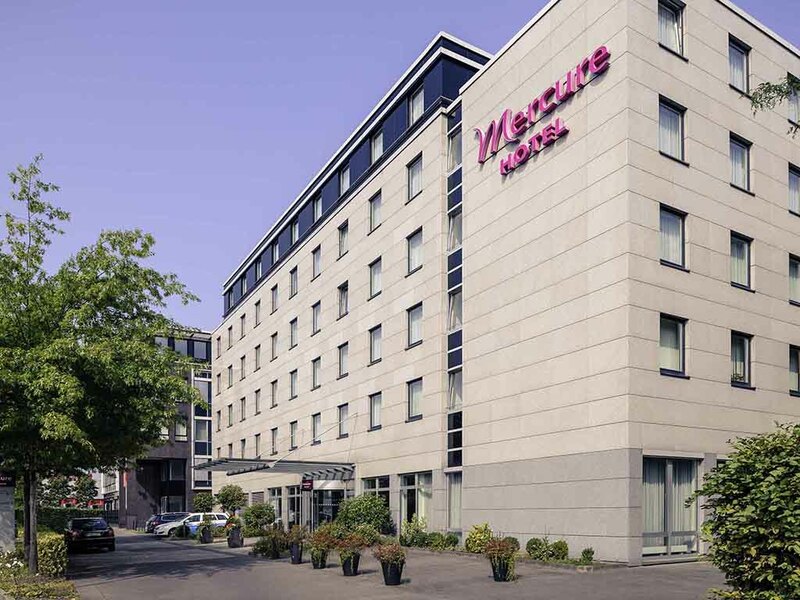 At the 4-star Mercure Hotel Düsseldorf City Nord, you have the choice of Standard Rooms with queen-size bed, double bed or twin beds and Privilege Rooms with king-size bed. All 190 rooms are air-conditioned and equipped with WIFI. One child aged up to 16 may stay in your room free of charge. Your pet is also welcome to stay with us for a fee of EUR 12 a night. Our laundry and ironing service will take proper care of your clothing and laundry needs for a fee. Our restaurant PIAZZA offers international cuisine, regional specialties and an excellent selection of wines from the Mercure wine list. We are open Monday to Friday midday through 10pm and at the weekend 6pm through 10pm. In our bar and restaurant PIAZZA, we will spoil you with culinary delights, serving international and regional specialties. End your day by relaxing with a glass from our Mercure wine list. It was a very good and pleasant stay. Free drink voucher was present. The welcome desk + the restaurant employees were very nice. I sleept well; the hotel has no fitness room, no sauna. E.g. Mercure Erfurt built this into the parking garage. Unfortunately, I was robbed at breakfast in the restaurant, where my wallet was pick pocketed. I contacted the hotel in the morning and then in the evening. The Duty Manager informed me,the police would be contacted and the Hotel Manager would contact me the following morning, so I could claim back the stolen money. However, after chasing I have not received any contact. Good online check-in process. Arrival OK. Room basic but adequate. A bottle of water would be nice. WiFi poor and cumbersome to connect - even with voucher for &quot;Premium&quot;. Same issue every day. Perormance poor. Breakfast good. Checkout OK.
A lovely clean and realistically priced hotel. The breakfast was excellent with a large variety of foods available. Comfortable Bed, But some amenities could be added in the room perhaps some slippers,complementary water. There is no mini bar in the room. These items could bring value to the hotel and the guest needs. I stayed in room 206, Room was clean but some stains on the carpet still visible. Also at the breakfast, I was not greeted very friendly. Staff needs to be more friendly and helpful.. not to tell you that you can get your own coffee or Tea!! Perhaps I should stay at some other Hotel where staff is more proffessional and friendly. Thank You for reading my comments..! Offering limited by 10:00pm arrival from airport. Expected level of service with the exception of food availability after later arrival. Your bar manager was superb and made me a pizza. Room comfortable, but no mini-bar????? very good apart from the meal we had on Friday evening only gave us one drink free and I thought as two persons were in the room as a silver member we got two free drink vouchers not one. Then a glass of house wine was fifteen euros! Clean, friendly staff, great to have no charge on breakfast in the room. Good breakfast, room in level 5 ok, good service from the team but one of my main criteria is the shower and it was really not a good moment at all. Good service, clean and nice room; excellent breakfast! Rooms towards the main street are unfortunately a bit noisy.